It’s time for us to be the sobering voice of reason and remind you of the dangers to our pets posed by the holiday season. 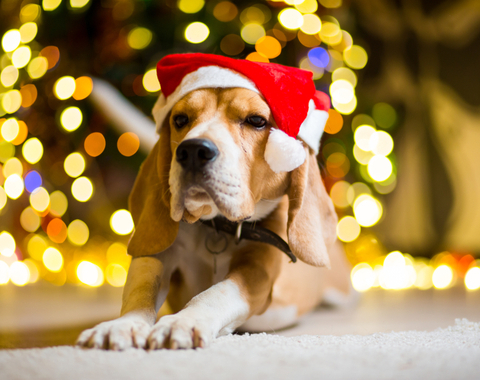 As your mind drifts to holiday gift lists, vacations, and the slew of events that occur during December, it is important to keep a close eye on your pets to ensure they are safe, healthy and happy. Cats love ribbons. Cats eat ribbons. Cats are not meant to eat ribbons. If you have a cat, just avoid ribbons and if you get a gift with ribbons, throw the ribbons away immediately. If you are giving gifts to someone with cats, avoid ribbons. At the risk of disrupting the ribbon industry, I would be happy if ribbons were banned from holiday traditions. The same applies for dogs. Dogs and cats eat tinsel that can cause an upset stomach (diarrhea, vomiting, pain, etc.) or worse a foreign body obstruction that requires medical intervention. Dogs and cats also like to chew on Christmas trees and wreaths. In addition, they can experience allergic reactions to Christmas trees, wreaths or maybe even the glue and fake snow sprayed on them. There is no great way of preventing your animals from getting to these things unless wreaths are hung in places they can’t get to and the tree is put in rooms that can be closed when you are not present. More seriously, electrocution is possible and can cause fatal effects if your pet chews on lights and ornaments. Ingestion of glass ornaments can cause severe mouth and gastrointestinal bleeding. Cookies, cakes, hams, yams and candy can be found around the house during holiday season. Your pets will be wanting to indulge in these treats just as much as you. However, these treats if ingested by your pet can cause stomach pain, diarrhea and vomiting. By keeping treats covered and out of your pets reach, you will be able to prevent illness. Just like treats, your pet may eat plants around the house. Poinsettias, mistletoe, and holly can all cause gastrointestinal upset, especially if a large amount is eaten. Ingestion of decorative plants such as lilies and daffodils can cause severe irritation or be fatal. Pet anxiety during the holidays is common. Pet owners are leaving their homes for long periods of time or having many people at their home in which can cause anxiety for your pet. Traveling may also create added stress for your animal. It is important to be sensitive to your pets needs and acknowledge that they may not be comfortable during these times and take the measures and precautions in easing their stress. Just like pet owners and people, pets get cold as well. Despite their fur, pets can get cold and sick due to the weather. Be considerate of how long pets stay outside during cold days to prevent illnesses from arising. The holidays aren’t just stressful for humans, they are for our pets as well. It’s crucial to be aware of our surroundings during the holiday season to be sure that our pets are safe and comfortable.